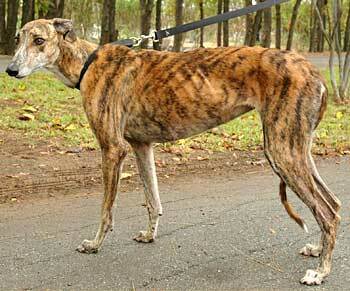 Peanut is a sweet almost 5-year-old small brindle female, born February 2001. Peanut came to GALT as a stray from Fort Worth Animal Control. 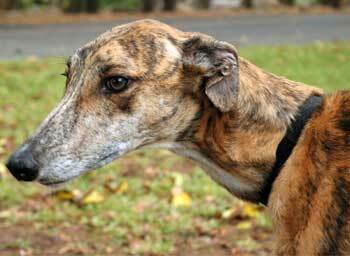 Like many of GALTs strays, her right ear is double tattooed, so her life up to now remains a mystery. Also, like many of the strays, Peanut was positive to Ehrlichia, a tick-borne disease. Peanut has received successfultreatment for the disease, which took 8 months! 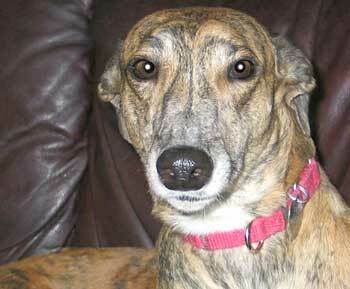 Her Ehrlichia titers indicated she had experienced exposure but she was asymptomatic. Her titers dramatically decreased, and her CBC shows rapid improvement. Peanut will need to be monitored annually for the rest of her life to insure the Ehrlichia titers stay low. She has completed all her medical procedures and is ready to find her forever home. Peanuts foster home is in Austin at this time. It is not known at this time if Peanut is small animal or cat tolerant.